1. These mini crew socks use moisture wicking THOR•WICK® COOL fabric to keep feet feeling cooler! 2. The socks are also cushioned in the heel, toe and sole for added blister protection. 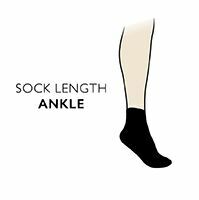 The mini crew sock design is an ankle sock style which will give support to the ankle area and reduce rubbing against your trainers so you can clear your mind and allow your feet to take you where you want to go!